In spirit of St. Patrick’s Day on Saturday I wanted to Celebrate the Irish. Ireland has a great deal of wonderful, beautiful treasures and I could post a book describing them all. 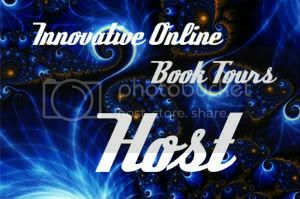 So I hope you enjoy my selected few! Blarney Stone: Located in County Cork Ireland the stone is said to be the deathbed pillow of St Columba on the island of Iona. Legend says it was then removed to mainland Scotland, where it served as the prophetic power of royal succession, the Stone of Destiny. When Cormac MacCarthy, King of Munster, sent five thousand men to support Robert the Bruce at Bannockburn in 1314, a segment of the historic Stone was given in gratitude – and returned to Ireland. Others claim the stone was brought from the Crusades. Whatever the truth of its origin, the prize one kisses the stone the gift of eloquence is granted. Four leaf clovers (Shamrocks:) In Irish tradition the Shamrock or 3-leaf Clover represents the Holy Trinity: one leaf for the Father, one for the Son and one for the Holy Spirit. When a Shamrock is found with the fourth leaf, it represents God’s Grace. The four-leaf clover is a universally accepted symbol of good luck. 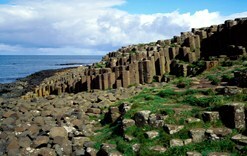 Gaint’s Causeway: Located in County Antrim, Northern Ireland, this stretch of geological phenomenon is renowned for its columns of layered basalt. It mystified the ancients who believed it to be the work of giant Finn McCool. NewGrange: Located in County Meath and older than the pyramids, the megalithic passage tomb covers around an acre and is surrounded by 97 kerbstones, some of which are decorated with megalithic art. 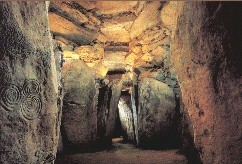 The passage and chamber are designed to light up for the summer and winter solstice. The Wearing of Green: One wears green because the Catholic side of Ireland is identified with green, and St. Patrick is a Catholic Saint credited with converting the island to Christianity. Whereas the Protestants are identified with orange, and are often called “Orangemen”, as in King William the Orange. The Irish flag, the white between the two colors representing unity. Wearing green is an American thing.